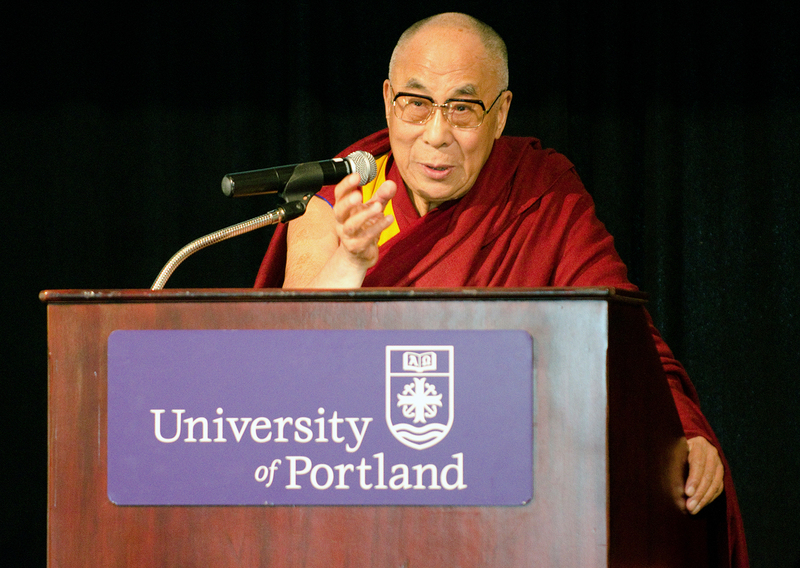 The Dalai Lama came to Portland this past weekend and I had the opportunity to go hear him speak. Michael came with me and my cousin Anna brought a few of her friends as well. I saw the Dalai Lama the last time he came to Portland (over 10 years ago) and it was one of the most compelling and memorable experiences I’ve had. I think he arrived in Portland on Wednesday. People were abuzz. It seemed like everywhere I went for the next few days, people were talking about it! I met a friend for dinner at the Tao of Tea on Thursday and every table in the place was discussing HH The Dalai Lama and his speaking events. It made me even more excited to see him on Saturday! Saturday morning I got up really early to get my workout done because the event was going to last pretty much all day. Michael and I met Anna and her friends at the Coliseum and we got in the monster security line. Security was very tight, rightly so, and it took extra time to get in and get to our seats. 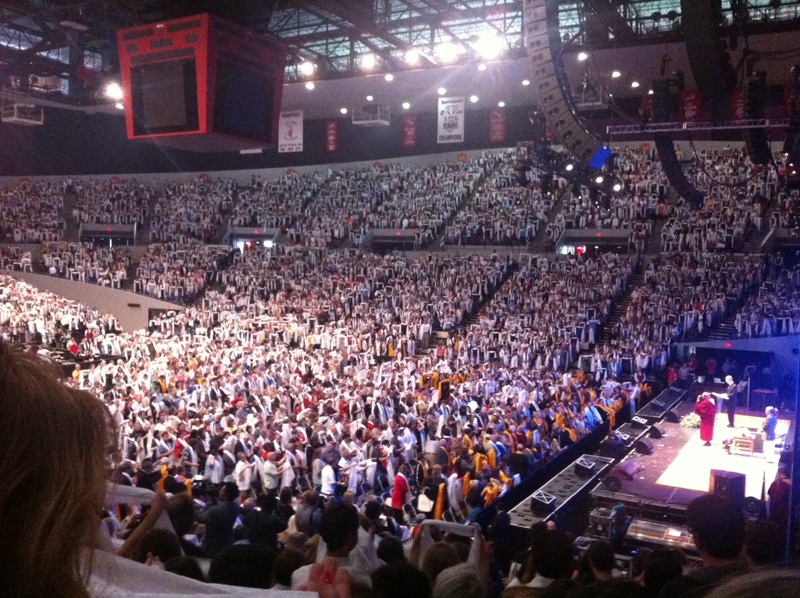 There were about 10,000 people at the Coliseum to hear him speak. The first half of the day was the panel of guests, HH The Dalai Lama, Andrea Durbin (the executive director of the Oregon Environmental Council), Governor John Kitzhaber, Dr. David Suzuki, David Miller from Think Out Loud and Darren Aronofsky (he directed Black Swan). The subject was the environment but the discussed all topics from clean air and water to politics, economic reform, religion and consumerism. What I took away from the panel discussion was that there is much more we can all do and it comes down to laziness and convenience. It definitely takes more effort to make choices that are better for the environment. For the last year or so I’ve been trying to get away from eating processed foods. That alone has reduced a lot of the waste that we have but it doesn’t get rid of all of it. There are still things I can do personally to reduce my footprint. It just takes effort. I did realize that Michael and I both try pretty hard to do better things for the environment, health, our bodies, our home. Michael commutes by bike. I COULD take public transportation but I hate it. (I know, I know.) We grow our own vegetables, we compost, recycle. Michael keeps reminding me to turn the lights off when I leave a room (I know, I’m terrible at this). The Dalai Lama said he does his part by not taking baths. 🙂 He said he takes showers (twice a day) and joked that the two shower a day habit was probably just as bad as a bath. If you’ve never heard the Dalai Lama speak, it’s pretty surprising. He’s so down to earth and FUNNY. Seriously, he’s hilarious. I was laughing through the whole presentation. Someone asked him about his thoughts on overpopulation and the effects on the environment. His response was that “all life is precious” but that “maybe have smaller number of precious life.” It was the perfect response and got a good laugh from the crowd. I apologize for the terrible pictures but you couldn’t bring cameras in, so iPhone it was! Our “limited view” seats actually turned out to be awesome! We were right by the side of the stage. He stressed that the source of happiness is not consumption, but nature and nature is not free and unlimited. We are isolated from nature these days–even to the point of having artificial plants in our houses–and he said that the way to happiness was a lifestyle change. Boy did I agree with that! Somewhere along the line, the pursuit of happiness that all Americans expect became the pursuit of money and success. The result of this is less family time, less community involvement, less time in nature. When we’re on our deathbed, we won’t be thinking about a closet full of fancy clothes or what possessions we may own, we’ll be thinking about our family, friends and memories. That is wealth. He then said something that was pretty powerful for me. He reminded us all that Buddha was not born in a castle. He was born under a tree. And he didn’t find enlightenment in a monastery, but under a tree once again. So much of our history is tied into our nomadic ancestors that traveled around the world according to the seasons and what food they could find in season. Sure we’ve made progress and can go to the grocery store any time of the day or night, but I think something is getting lost in that convenience. I think that we’re out of touch with where our food comes from, what is healthy, how the body should work for it’s food and what happiness is as a result. The conference broke for lunch and we had two hours before the second half started. The five of us ended up walking to the Queen of Sheba Ethiopian restaurant, which wasn’t too far from the venue. It’s one of my favorite Portland restaurants and it’s been way too long since I’ve been there. We ordered: mustard greens, chickpea stew, a vegetarian dish with potatoes, cabbage and carrots, lamb in a spicy Berbere sauce, chicken in a curry sauce, spicy beef tips and one other vegetarian dish I can’t remember now. 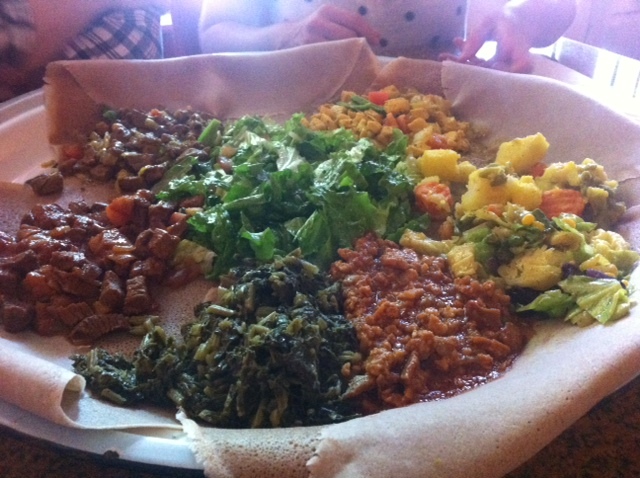 We ate it with the injera bread and pretty much devoured everything like a pack of wild dogs. We left the restaurant with satisfied bellies and walked back to the Coliseum. It was hot out, about 87 degrees, and the sun felt nice. 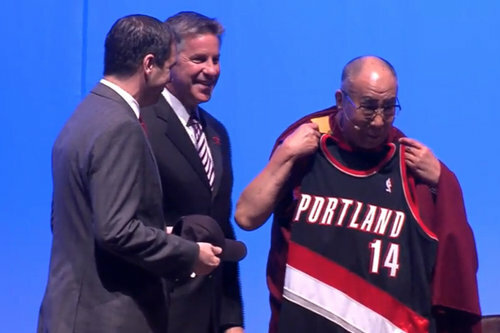 When the conference resumed, the Dalai Lama was presented with some Portland swag by the Portland Trailblazers. He joked that he had “no use for the jersey” but that he loved the hat and he wore it the rest of the day! 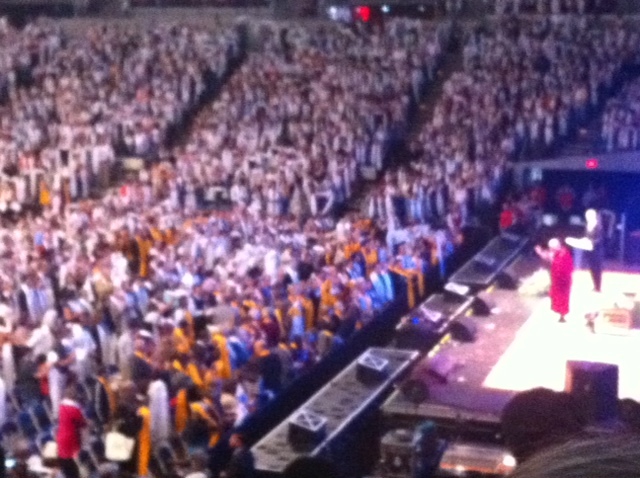 The afternoon portion was just the Dalai Lama speaking to the crowd. There was no panel, it was just him and his translator who would pipe in once in awhile if HH couldn’t think of the word he was trying to say. What I love most about the Dalai Lama is that he’s very grounded and realistic. He doesn’t have that “out of touch” kind of view that a lot of important people tend to have. Even our managers at work can be out of touch with the reality and the practice of day to day life and doings. How many of us have come across someone of importance who just seemed clueless about reality? Yeah, the Dalai Lama is not like that. “Buddhist practice is based on reality,” he said. “Reality teaches us. Ultimately, we are part of nature.” He also said that the solution to fixing the environment issues was NOT prayer, but education. Education was his answer to a lot of issues people brought up. The conference was drawing to a close. Before HH The Dalai Lama left, though, he gave everyone a gift. We’d all received a rolled up scarf when we got back from lunch. He told us all to stand up and we put the scarf on. He explained that the Khata scarf was a blessing and a gift that symbolized unity and compassion and to symbolize that we are all one. There was something truly amazing and emotional about 10,000 people putting on a Tibetan prayer khata and being blessed by the Dalai Lama. It was one of the most wonderful experiences of my life. I’m so glad I was able to see him again. The conference was over and …. totally bizarre…. the Red Hot Chili Peppers played a concert after the Dalai Lama left. I wish they’d explained how the RHCP happened to go on tour with his Holiness, because it was totally odd. But the Chili Peppers were pretty darn good live! I’ve never seen them live, I was a big fan when I was 15 years old but haven’t been lately, and I enjoyed the show. The rest of the day will be in another post. Sorry if this ended up being a super heavy post for a Monday! What an amazing experience. I’m so glad you wrote about this because I am seeing him speak next week in Louisville (I’m going alone) and was wondering what to expect. I am so glad to have read your experience. Oh wow! Enjoy!! It was so so amazing, words cannot really express how special it is. Please let me know what your experience was like. Wow, that is so cool! So glad you could see him twice!! Happy Monday! Holy cow . . . what a fantastic opportunity!! 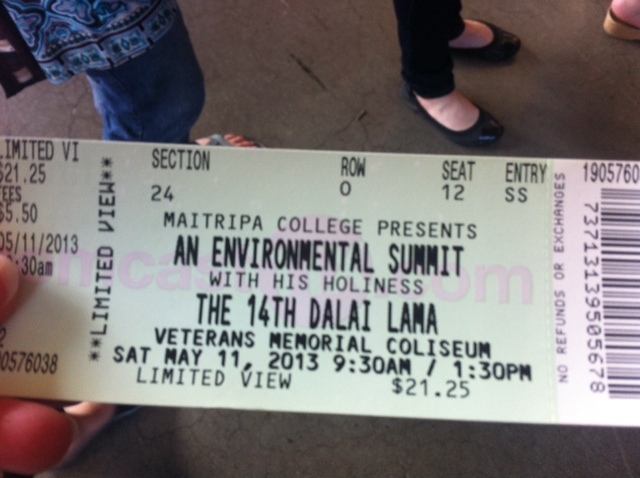 I would have loved to hear the Dalai Lama speak! So incredible that you were able to attend (and those seats were pretty awesome!!). If you can go see him, I recommend it. I don’t know what his “tour” schedule is like, or if he’s coming near you but it’s worth to travel for! That’s so cool Lisa! Sounds like he’s a freakin’ rock star. It takes someone special to remain humble when presented with that kind of adoration. Very cool. And to top it off with the Red Hot Chili Peppers is just plain epic! What a crazy combo. But it sounds like it worked perfectly. He is very calm, very humble, just an amazing person! What an amazing experience this has been for you! I have read several of his books and have always been so inspired with his wisdom and insight. I was hoping to see him in Kentucky, but it just doesn’t seem as though it will fit into my schedule…perhaps next time. Thank you so much for sharing this! I love his books. They are always inspiring. Sounds amazing. RHCP and the Dahli Lama? wow….what an odd but interesting combination. Thanks for sharing the day with us Lisa.